Linux shared and reseller hosting with Direct Admin control panel. Domain registrations and internet service. Located in Alabama. Provider of UNIX virtual hosting, dedicated servers, game servers, and shell hosting. Servers in California, headquartered in Canada. Offers true virtual servers, dedicated servers, web control panel, and reseller plans. Servers are hosted on redundant OC-12 connections. Offers web hosting, virtual private servers, domain registration, dedicated servers and colocation services. Provider of CPanel based webhosting ranging from free hosting to managed dedicated servers. Servers in California and Georgia. Provides virtual hosting and dedicated servers. Headquartered in UK, servers in Atlanta, GA, USA. An international hosting and deployment platform for developers and web designers. Offers dedicated servers with preinstalled software and hosting offers for 4D Business Kit shops, Mail, and DNS Servers. Hosting on high performance virtual servers with security, and control. Offers shared hosting and dedicated servers. Supports PHP, MySQL and Perl. Offers virtual Unix hosting, dedicated servers, co-located servers and reseller plans. Web hosting on Unix servers with FrontPage, PHP and MySQL. Also co-location, dedicated servers and domain registrations. Microsoft Frontpage web site hosting, ASP, IIS, Virtual Servers, Colocated Servers, Databases, SQL Server, MS Access. Provides web site hosting, co-located servers, managed servers, emails, databases and e-commerce. Provides high web services, web hosting, resellers packages, dedicated servers, web design, resale of virtual servers, domain name registration. Offer co-located servers, dedicated servers, web site hosting and mail services. Servicing Southern California and covering the entire IT Infrastructure, Internet and WAN connections, VPN & firewalls, Web Servers, SMTP, e-mail servers, file servers, database servers, switches, wiring, workstations & DRP. Offering virtual private servers, reseller options and dedicated servers on Linux and Windows. Control panel demo, rates from 25 MB to 1 GB of webspace. Offers web hosting with Red Hat-based servers, also offers design, custom graphics, and shopping cart services. Offering hosting on dedicated web servers and Oracle Servers, web development, search engine submission, domain registration, digital photography, and e-commerce solutions. List of public news servers. Search for servers carrying particular newsgroups. Provides some statistics on listed servers. An overview on how DNS works and tutorials for installing and configuring DNS servers on Linux and Microsoft Servers. Shell services provider, supporting Eggdrop bots, IRC, ircd servers, web hosting,web space, and domain names, Dedicated Servers, Jails, WEB, eggdrop, bots. Custom cross platform 4D database developers and web hosting services. Custom web servers and database web servers without middleware. Offering web hosting packages and dedicated servers to businesses and individuals. Offers web hosting, dedicated servers, co-location, and application hosting services. Offers shared web hosting, dedicated servers and domain registration. Offers hosting, dedicated servers and reseller accounts. Hosting, design, and promotion. Linux based servers. If the business hours of Dixie Internet Systems in may vary on holidays like Valentine’s Day, Washington’s Birthday, St. Patrick’s Day, Easter, Easter eve and Mother’s day. We display standard opening hours and price ranges in our profile site. We recommend to check out dixiesys.com/ for further information. 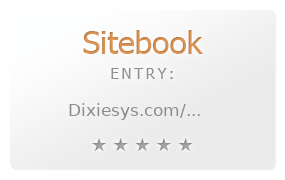 You can also search for Alternatives for dixiesys.com/ on our Review Site Sitebook.org All trademarks are the property of their respective owners. If we should delete this entry, please send us a short E-Mail.